Awhile back, my husband and I decided to try making our own vanilla extract (mainly for cost savings and gluten free reasons). We discovered – we loved it! No more purchasing vanilla in the store or on-line for us. And, it’s nice knowing what ingredients are in it. We no longer have to worry about additives found in store-bought vanilla. Our homemade vanilla has amazing flavor and the aroma is magnificent! And we have a little secret to share, it makes a wonderful gift for those that love to bake! While making vanilla may take a little prep time, the process is quite easy. All you need is some vanilla beans, alcohol and some time. First you need to purchase some vanilla beans. 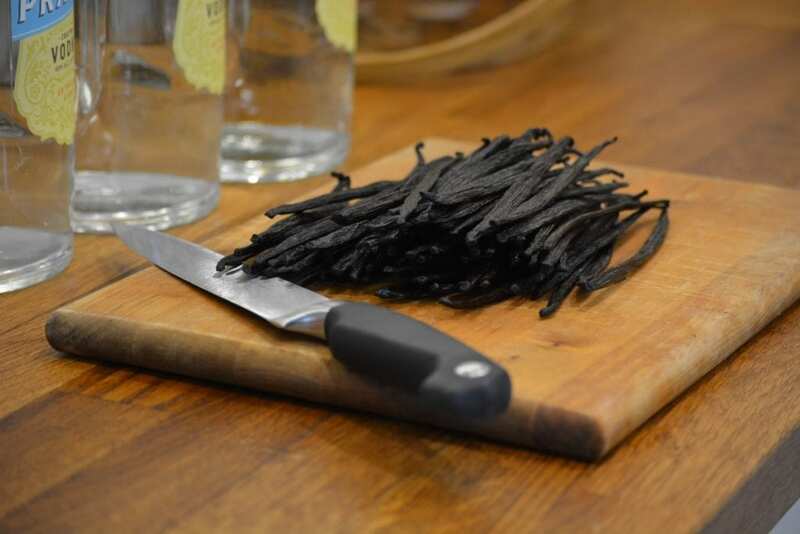 Since vanilla beans can be expensive, it is definitely advantageous to buy them in bulk. In the past, we have purchased our beans from https://www.starwest-botanicals.com, https://www.mountainroseherbs.com and https://www.azurestandard.com. We like to look for organic, fair trade vanilla beans. 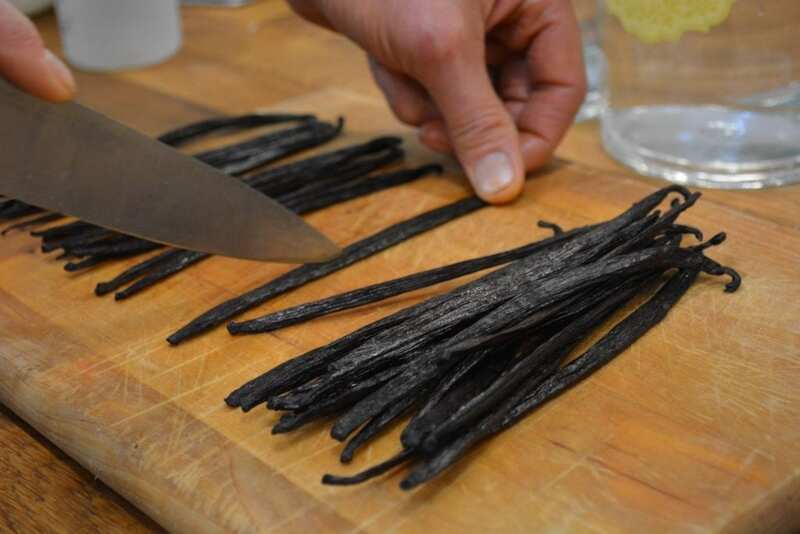 Begin by cutting your vanilla bean pods in half lengthwise exposing the inside of the bean. You will notice that the inside of the bean contains seeds. We just leave all of those seeds in the pods. Depending on what jar you are using, you may also need to cut your beans in half so they fit. The most commonly used alcohols in making vanilla are vodka, bourbon, brandy and rum. 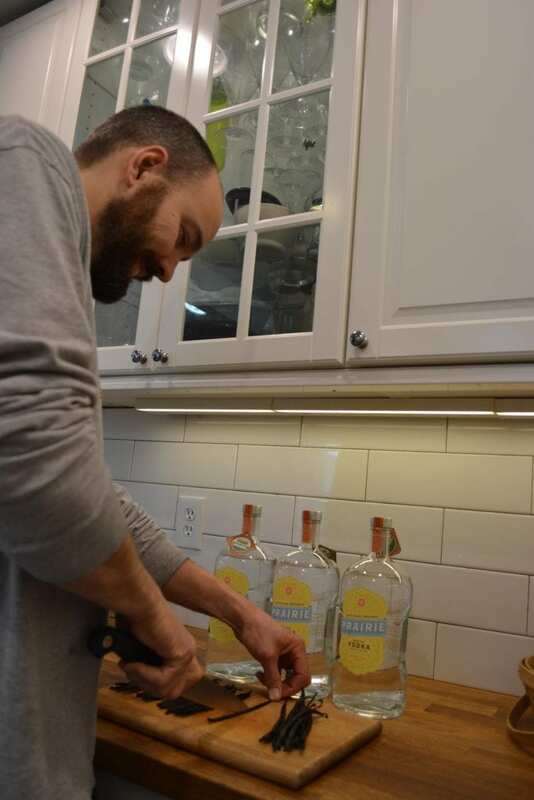 We wanted ours to be free of GMOs and be gluten free, so we went with an organic vodka that is locally grown and uses organic corn. While you can use whatever container you wish, we make such a large batch that we just place our vanilla beans directly in the alcohol bottle. We like to use 1 vanilla bean per 2 ounces of alcohol or 4 beans per cup. 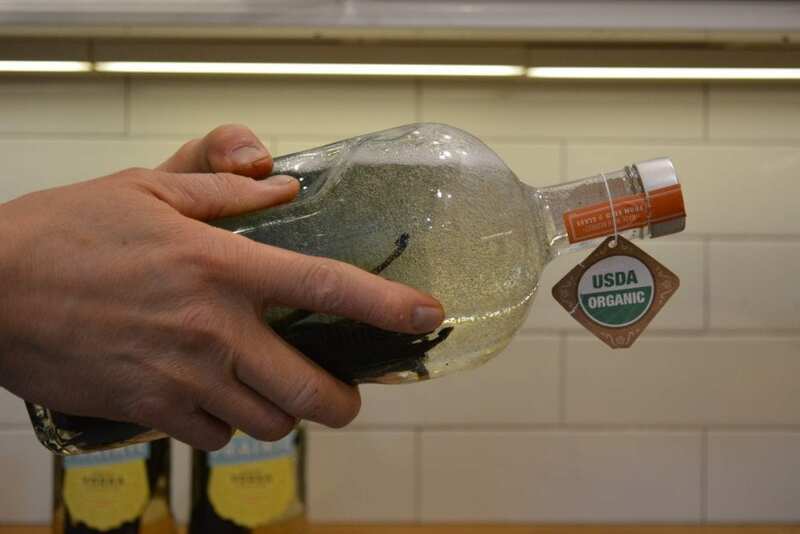 This can vary depending on how strong, or weak, you want your vanilla extract to be. 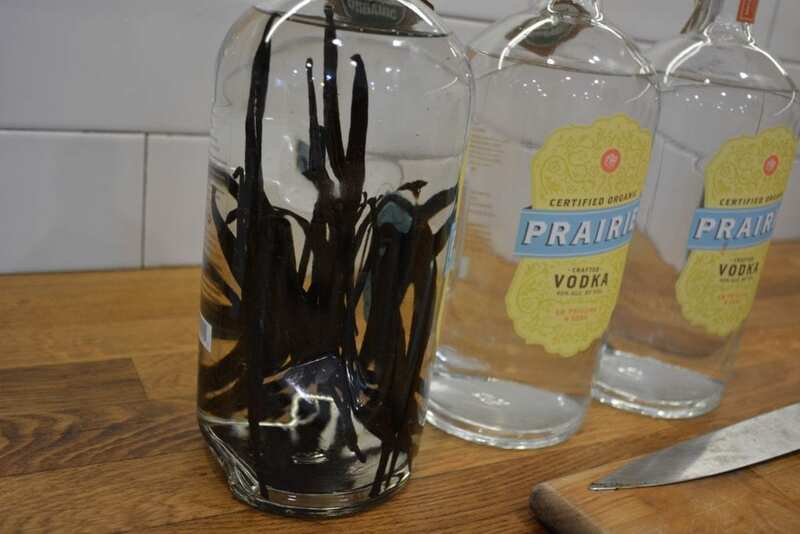 Once the alcohol and vanilla bean pods are in a jar, shake vigorously. You’ll want to shake the vanilla often over the next few days. We like to place the jars of vanilla in a spot where we pass by them or see them weekly so it reminds us to give them a little shake. Wait about 2-6 months, depending on how strong you wish the vanilla to be. Then pour into smaller containers to make measuring easier. You may want to strain the vanilla if you want the seeds removed, but we usually just leave them in for additional flavor. 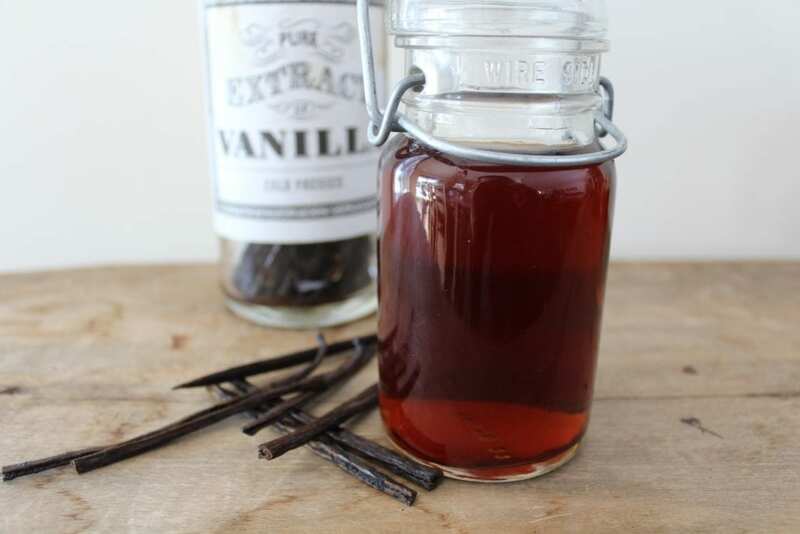 Once you are enjoying your homemade vanilla, remember to start your new batch so you have some ready for when you run out. Can I ask where you buy your Organic vodka? I found it at Total Wine!! I can’t wait to get my vanilla extract started ? Where did you purchase the pictured storage container for the vanilla? The pictured storage container is a small, antique jar, with a glass lid. It holds about 8 ounces. Maybe check out a local antique shop for something similar.